There will be so much more to add to this page in the coming months…. World Unlimited is a voluntary, not for profit, organisation formed in 1989 to bring the best in International roots artists to Birmingham and the West Midlands. The late Richard Wallace of Oxfam was one of the key players in setting up the organisation, Brian Parsons of Bongo Go was then engaged to produce the first events then Richard asked Graham Radley (who he had worked with on Oxfam/Anti Apartheid’s ‘Yiva’) to add his many years of music promoting experience to World Unlimited. 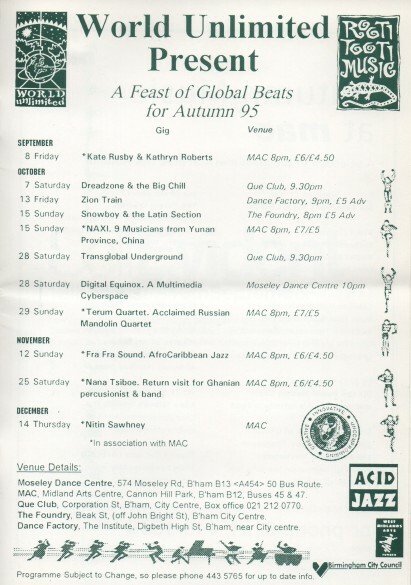 Six events were held in the first year starting with an amazing Moseley Dance Centre show from Kanda Bongo Man and it is from that humble beginning that the organisation has grown to promote between 80 and 110 shows per year. Our aim is to present, via live performances, the best musicians from cultures worldwide as well as providing performance opportunities for UK based musicians including a focus on local artists. 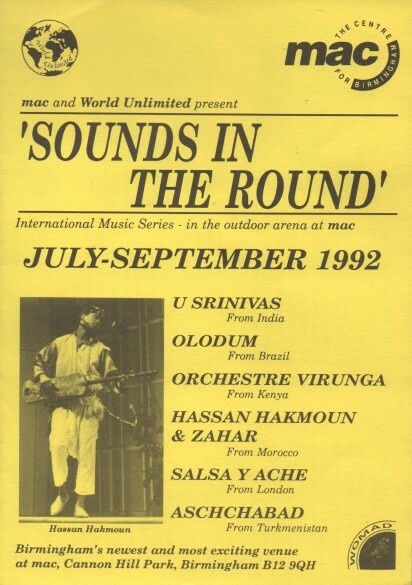 Since 1989 World Unlimited has provided a valuable and significant contribution to the delivery and appreciation of global folk roots music throughout Birmingham and the West Midlands. 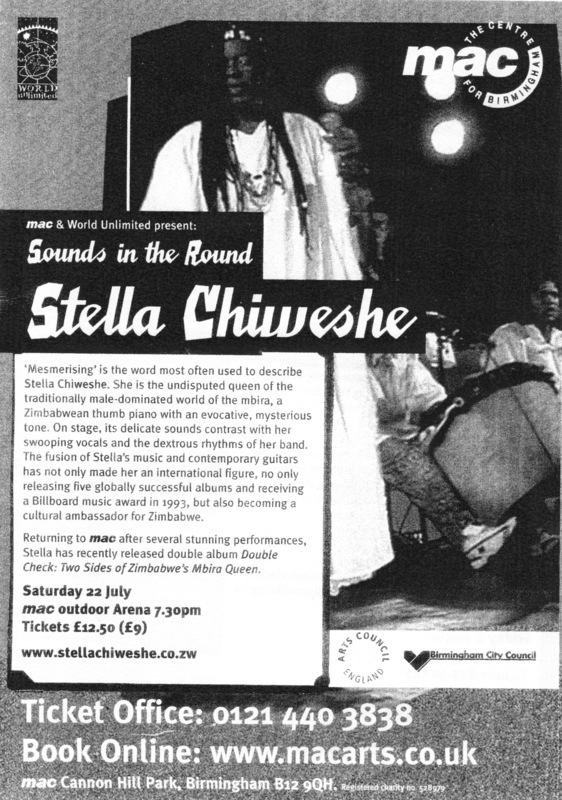 We endeavour to continually develop the global roots music audience in the region for the benefit of all. 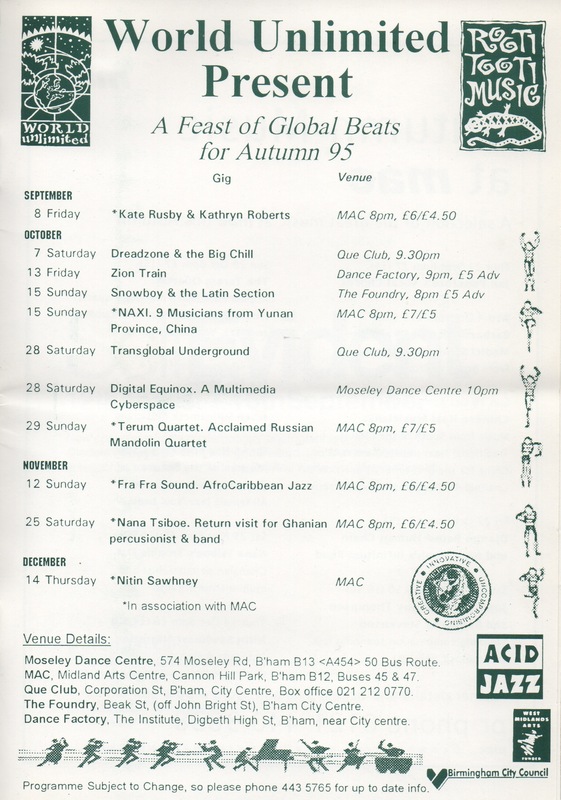 Womad, African Promoters Network, The Irish Festival, Moseley Festival, Latin Promoters Network, Shambala Festival/Jibbering, Oxfam, Wychwood Festival, Medicine Bar, Birmingham International Music, Music Links, Moseley Folk Festival, Music Alliance and Wolverhampton Civic Hall venues. We like to work in partnership with other organisations, venues, city councils etc as we can share our knowledge, develop audiences for marginalised music and link in to our own promotions. Our partnerships take shape in many different forms, we may for instance, work in an advisory capacity to bring our expertise into the planning of festivals and music events such as Birmingham City Council’s Big Splash event whereas our partnerships with new venues like Kitchen Garden Café are about developing and building new audiences for each venue and for World Unlimited. We have always brought not only the established touring artists into the region but have championed and showcased new and emerging talent over the years. For instance, Birmingham Town Hall’s recent programme features many of the artists who World Unlimited have developed and grown an audience for year on year in Birmingham such as Seth Lakeman, Beth Nielson Chapman, Billy Bragg, Eliza Carthy and more. As these and many other artists are playing on bigger stages, World Unlimited is working to showcase current new and emerging artists. 1992 Roots, Strings & ‘Tings – – a partnership with Birmingham Town Hall to showcase local emerging artists. featuring Crucial Music, Afro-Bloc, Jamma, Conservatoire String Quartet Fire, Water & Rhythm – a live, open-air performance event in partnership with Brindley Place and B.C.C. 1994 Oumou Sangare, FunDaMental. The Longest Day – a one day world music festival in B’ham Town Hall featuring both local and international artists. In 2009 our 20th Anniversary year we will see the return of the amazing Kanda Bongo Man, a workshop series with Matimbah Kuadashe, a new bigger Music Room series for local artists including the Old Dance School, Lazy Lizards and Kings Of Spain. Other artists booked in include JTQ, Transglobal Underground, Rachel Unthank & The Winterset, Ben Taylor, Ruarri Joseph, the Handsome Family, Judith Owen and a special link with Symphony Hall’s Seth Lakeman show as Seth has kindly agreed to be World Unlimited’s patron during our 20th Anniversary series. World Unlimited 1989-2009; 20years of musical adventures & still on a voyage of discovery.